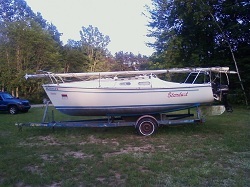 Well folks, after trying to sell my C22, Wabi Sabi, with absolutely no one inquiring about her all summer long, I am donating her to our local Community Sailing Center. I advertised in many different Facebook selling groups, in Sailing Texas website, and on Craigslist and not one bite. Started out at $6500 and kept reducing the price until I finally got down to asking $3500, which meant I would negotiate...but to no avail. 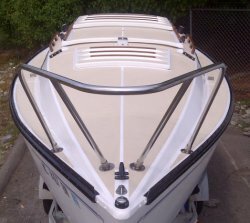 Now those on this forum know the amount of restoration work that I had done on my boat. I would state that she was probably better than factory new after I finished her. But the market is fickle and it seems that folks want an $8000 boat for $2000...but I wouldn't know that because no one offered anything. I am not naive...I understand that you will never get the money back out of any hobby project like boats,cars,airplanes and such. They say that the best two days of your life are the day you buy your boat and the day you sell it. Well it is bittersweet that I have to let her go for a tax write off, but I am certainly glad that she will be used to bring more people to the sailing sport and will stay here in town, so I can see her out on Lake Michigan. I want to thank everyone on this forum for all the advice and help that they have provided to me over the last 7 years. I hope that the work videos that I have posted on YouTube have helped out those working on their own boats. I will not be a Chrysler owner anymore, but I will remain a member of this forum and will check in regularly to offer any knowledge I have obtained through the restoration of my C22. Sorry to hear nobody grabbed it up, Bill! They would have gotten a sweet boat! I was twisting one of my coworker's arms to jump on it, but he just isn't financially able. Thanks Mark and Bob. My wife also likes to remind me of what I spent and of all the time I used working on the boat. I tell her that at least I wasn't wasting my time in a bar. And with that note....I'll go have a beer. Bummer that you never sold it. I've always enjoyed all the info you're provided over the years. I still plan to put some of it to use on my C22, despite the fact that I just bought a C26. 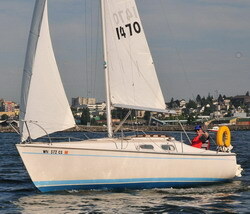 So you say you're no long going to be a C22 owner....does this mean you've bought or are buying another sailboat? Yea, it's been a while since I've posted and the day I check back in Bill has given away his baby. As for the 2 best days, buying my Chrysler 22 was indeed a good day, but I had far better days sailing the Honu and hanging out on this forum with Captain Scott, EE, Bill and everyone else here. I hope you will continue to hang out here on the forum, because as this post confirms, old Chrysler Sailors never really go away as proven by my post right here. I've been absent, but I'll never leave. The Honu sits in my driveway on it's trailer, in desperate need of a cleaning, but it is still rock solid and ready to ply the Waters of Puget Sound again in the near future I hope. Clearly Bill there was a disturbance in the Chrysler Sailor forum Force today. I felt it, as I'm sure other absent captains did. You'll always have a watch on the Honu if your in the area and I have it back up and running again as I hope in the coming year. Thanx Alan, I will check in and see if anyone has a question that I may be able to answer or address. All the best to you and may you soon sail Honu again. Bill, I watched all of your restoration videos and then just saw this thread. If I had seen this thread last year in time, I surely would have purchased your C22. Nice boat, great videos! Well I think the rebuild was good for you. It kept you off the streets if you know what I mean. I am a new member of this forum, and a new owner of a 1979 C22, and am finding your videos extremely useful. Can you please send me your drawings for the rudder through hulls? Also, what are the mushroom bearings I keep seeing. Are they required for a 79 C22. Mine did not have any. 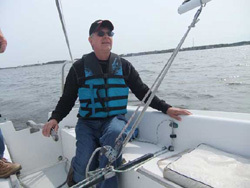 Astrorad, The community sailing group will be greatly helped with your C22. I hope they have some Special Needs Sailors.Thanks again, Bruce Jaeger KE7TDR.